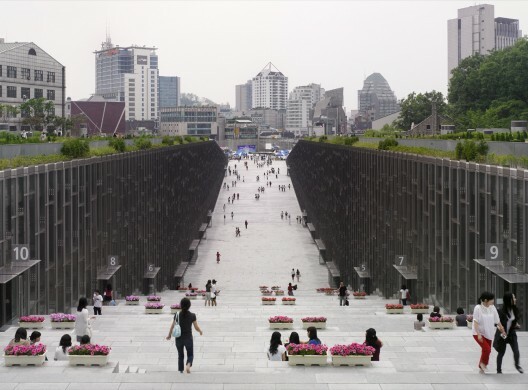 The complexity of the immediate site through its relationship to the greater campus and the city of Shinchon to the south demands a "larger than site" response, an urban response, a global landscaped solution which weaves together the tissue of the EWHA campus with that of the city. 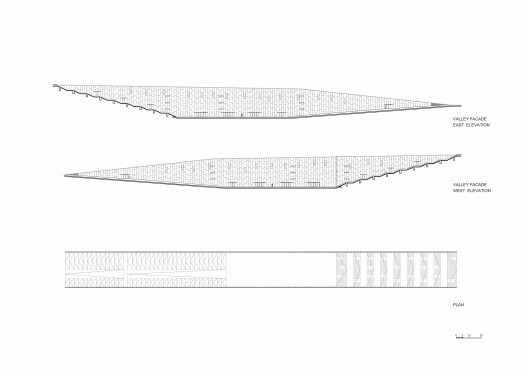 This gesture, the "campus valley", in combination with the "sports strip", creates a new topography which impacts the surrounding landscape in a number of ways. The Sports Strip, like the Valley, is many things at once. 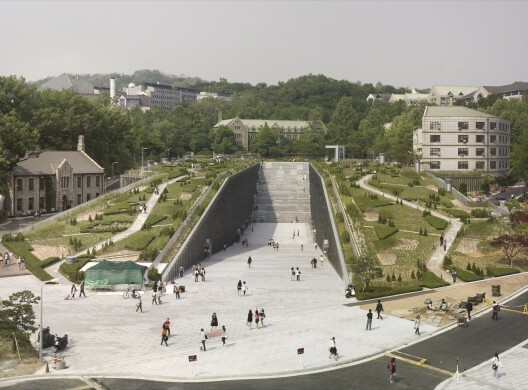 It is a new gateway to the Ewha campus, a place for daily sports activities, a grounds for the special yearly festivals and celebrations, and an area which truly brings together the university and the city. It is most importantly a place for all, animated all year long. Like a horizontal billboard, the sports strip presents the life of the university to the inhabitants of Shinchon, and vice-versa. Once through the sports strip, pedestrian movement and flow through the site is celebrated. A new "Champs Elysées" invites the public into the site carrying students and visitors alike through the campus center northwards, bringing together the different levels of the site. The pastoral nature of the campus is perhaps its most remarkable quality. It should be permitted to grow outwards, or inwards in this case, covering the campus center with trees, flowers, and grass. The park is re-drawn. An idyllic garden is the result, creating a special place for gathering, conducting informal classes, and simply relaxing. The notion of weaving together the campus is again evident, blurring the distinction between old and new, building and landscape, present and past. 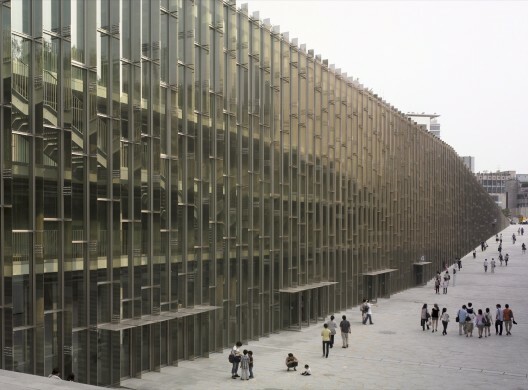 A new seam slices through the topography revealing the interior of the EWHA campus center. A void is formed, a hybrid place, in which a variety of activities can unfold. It is An avenue, gently descending, controlling the flow of traffic, leading to a monumental stair carrying visitors upwards, recalling les Champs Elysees or the Campidiglio in Rome. • A sculpture garden, where indoor gallery events can push outwards. 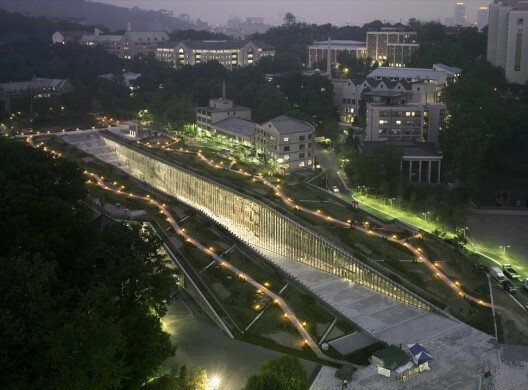 It is precisely this flexibility (conceptual and real) which permits the New EWHA campus center to inevitably weave itself into the landscape sometimes a building, sometimes a landscape, sometimes a sculpture.